Go for balance in your garden. A healthy garden will have an entire ecosystem of critters that keep things under control. Honeybees live all year round. They do not hibernate. When the weather is bad or flowers aren’t blooming, they live inside the hive eating stored food (honey for carbohydrates and pollen for protein). A colony needs about 45 pounds of stored honey to live from November to March in Eastern North Carolina. To store that much food, in addition to the hundreds of pounds of honey they eat all year long, bees need to find high quality nectar and pollen sources from March to October when most flowers are blooming. 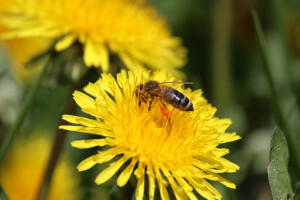 Weeds and natural habitats are extremely important sources of food for bees. Bees will travel, on average, 2-3 miles from their hive in search of nectar and pollen. 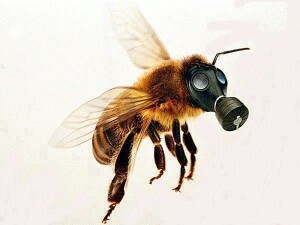 Many sprays may be listed as safe for bees. However, research has shown that herbicide and pesticide residues build up in the wax of honeycomb and can become toxic to a colony within three to five years. Those chemicals drift to the hive during application and also are brought to the hive when bees visit plants and flowers that have been sprayed. If the plants you remove are an important food for bees, please consider replacing that food source.